Founder of the label SONOSAX, Jacques Sax started his career in 1977 selling HI-FI equipment and installing PA systems in bars, discos, cinemas, shops, etc. All this was done from a small shop in Lausanne, Switzerland. At the same time he was managing sound for a good number of concerts of swiss and foreign groups and thus became familiar with the audio-professional equipments from a users point of view. With the intention of improving existing equipment, he very quickly started to develop new electronic circuits for special applications, and in the search for a high quality of sound, he undertook the development of mixing consoles, with a totally new modular concept answering specifically to the needs of sound engineers. 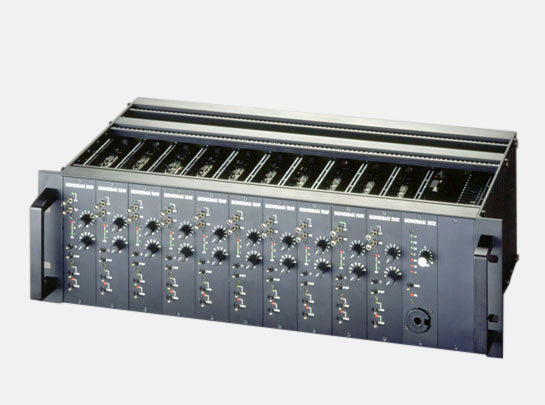 The first mixing console under the name SONOSAX sees the day in 1980. It was the SONOSAX SX-B. In the beginning intended for discos and TV studios it very quickly finds a larger audience thanks to its advanced technology and high quality, even though this tended to make the product rather highly priced. However quality never has been cheap and there was certainly no shortage of customers, as the professionals knew that this was a tool that would be instrumental in the success of their sound recordings. One of the reasons for the rapid success of the SONOSAX consoles has been the microphone amplifier, unequaled for its clear, clean and true-to-reality sound. Other models were to follow. In 1982, the very compact and modular SONOSAX SX-A is brought onto the market. With 12 to 24 inputs this console is intended for on site use, e.g. monitoring or recording of concerts. During the same period a device for the PA systems of pubs and restaurants is developed: the SONOSAX SX-C, which includes an auto-reverse cassette player, a TD-HF receiver (by telephone line), a talk-back microphone and a control speaker. 14 units were to be made. 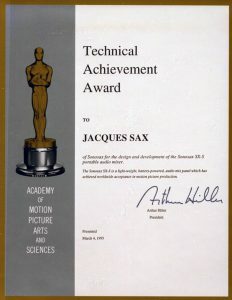 This brings Jacques Sax to concentrate on the portable consoles market; in doing so he conceives and develops the SONOSAX SX-S that becomes the “Mixer of Choice” for the film industry, immediately after its entry on the market in 1983. 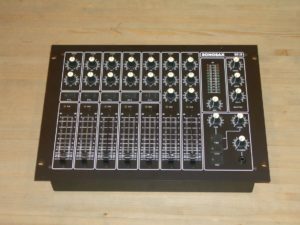 This portable mixing console, available with 6, 8 or 10 inputs is intended for professional use, either in the studio or on location. Built in a strong, rugged, anodized aluminum case, the SONOSAX SX-S Series provides the best solution whenever top performance, versatility and small size are important. This battery powered unit combines facilities normally found in studio consoles, in a very small package, covering the requirements of most OB and mobile situations without the need for external equipment such as limiters and equalizers. 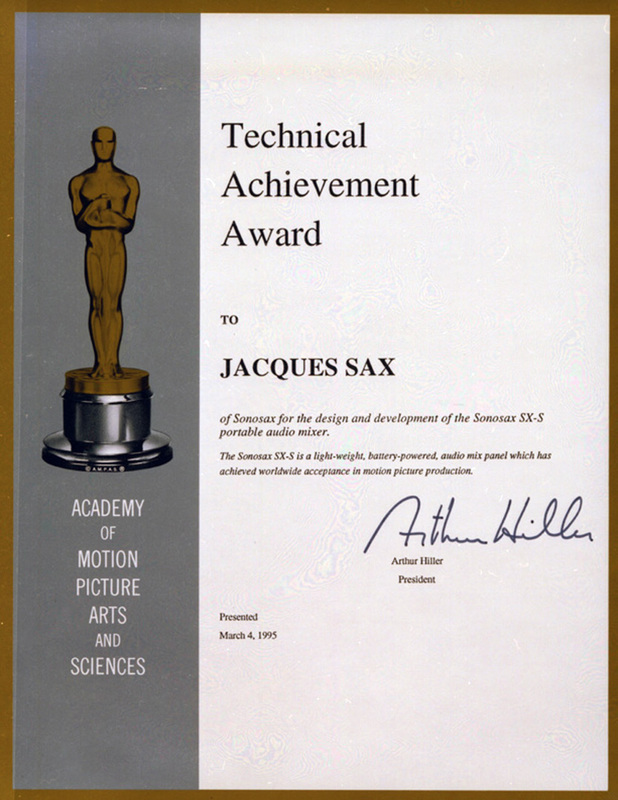 In March of 1995, Jacques SAX was awarded a Technical Achievement Award by the Academy of Motion Picture Arts and Sciences in Hollywood: the Americans movie industry appreciate the technical qualities and the design of the SONOSAX SX-S. 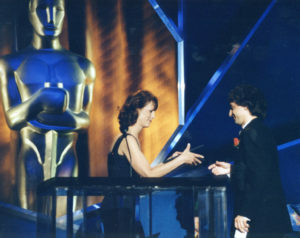 In Hollywood and European studios, the production sound mixers have made the SONOSAX SX-S their predilection mixing console and were keen to use it on prestigious productions directed by celebrities as famous as Steven Spielberg, Lucas Films, Stanley Kubrick, Pedro Almodovar among others. The list of films with the SONOSAX sound is quite long and includes, among other, great hits such as Chorus Line, Back to the Future, Schindler’s List, High Heels, Titanic, Silence of the Lambs. The last SONOSAX SX-S was delivered by February 2005, replaced by the prestigious SONOSAX SX-ST. Some 22 years after its launching nearly 700 SX-S mixers have been built and the great majority of theses mixers still in service to this days. In 1991 the perfection of the microphone amplifier, SONOSAX FD-M4, allows a clear reproduction of sound to a high level of perfection. The use of transistors only in its circuits proved to be a real technical feat, that made it possible to make “acoustic” recordings, rich in harmonics, that until then had been purely theoretical: The memorable concert of Miles Davis and Quincy Jones at the 25th anniversary of the Montreux Jazz Festival and the Ceremonial Theatre of the Albertville Olympic Games were equipped with the FD-M4. 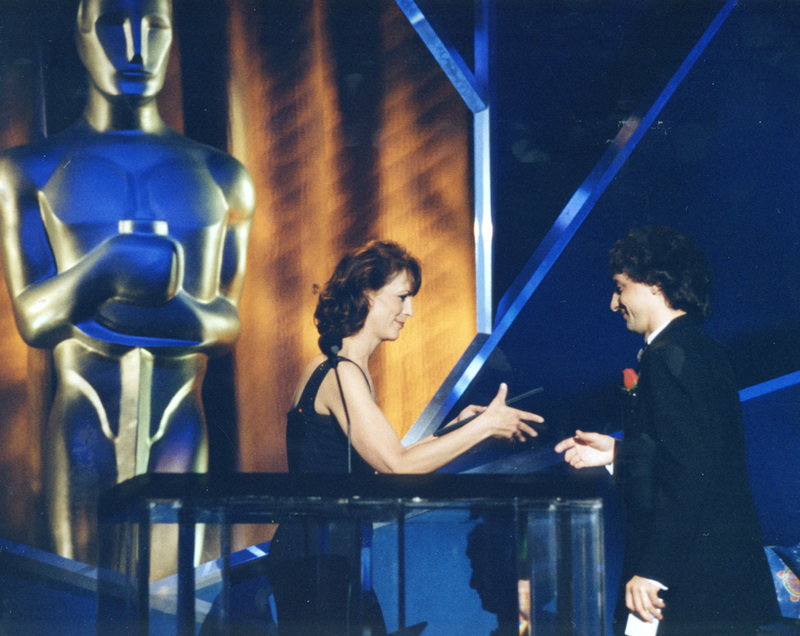 Sony Classics in New York and the Stadivarius Association are both equiped with the FD-M4. 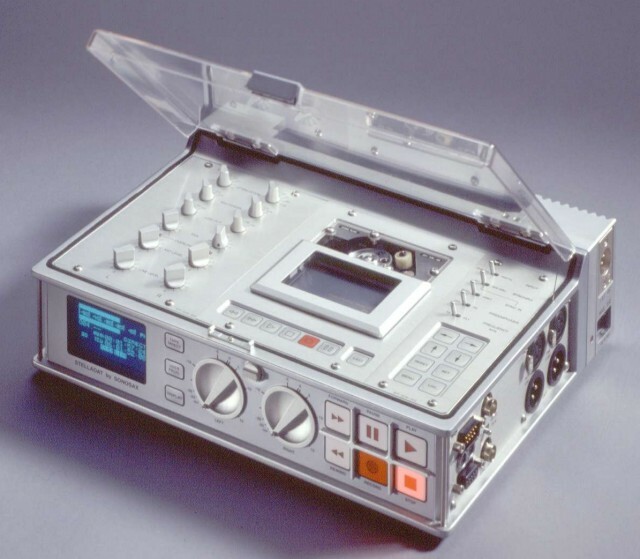 With the take-over of the label STELLAVOX in 1993, Jacques Sax can complete the range of SONOSAX products with the professional portable DAT recorder STELLADAT, launched a few years before. Perfectionist by nature, he decides to completely redesign the recorder to reach the level of quality that has made SONOSAX’s reputation. The production of STELLADAT I is stopped, to make room for the development of STELLADAT II, making a grand entrance on the international market in 1998. This unique 2-and-4-track DAT recorder has a true 4-channel mixer and is battery-powered with a running time of 3 to 4 hours. During the year 2001, SONOSAX moves to Le Mont-sur-Lausanne, in Switzerland, in an ancient house of the 18th century where Jacques Sax and his highly qualified team continue their innovations and complete creation and fabrication of SONOSAX’s products. 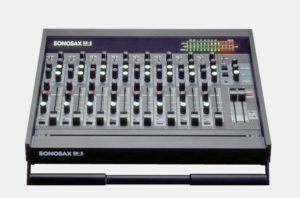 It is also in 2001 that the SONOSAX SX-BD1 comes out. This microphone preamplifier designed to fit on a boom pole targets mostly small productions. By being quite unique and having no equal in the world, it truly represent the sense for innovation that characterises SONOSAX. It allows the boom operator to control himself the sound going straight to the camera or in the mixer. As the price of the SONOSAX SX-BD1 is quite low, it completely suits small to medium budgets and is, in particular, used for Swiss productions. In this same year, the SONOSAX SX42 is being started; to make it’s coming out during 2002. This new mixer is based on a new concept and a very innovative design offering 4 inputs and 2+2 main outs and direct outputs as well. The design of the SX42 is the result of collaboration between Philippe Cahen, Antoine Cahen (ADN Design, Switzerland) and Jacques Sax. In 2003, the SONOSAX SX42 won at the IF International Design Forum Award. One will note the special gain structure that allows the operator to focus on the mix rather as on the gain control, and the quality of the microphone preamplifiers true to the reputation of SONOSAX. Its closed housing and the use of reed contacts makes it resistant to splashes of liquid and can be used even under very heavy tropical rains. Televisions around the world, including the Television Suisse Romande, and many sound technicians specialized in documentary have chosen the SX42 for its robustness and its possibilities for customization. It is also the first portable mixer offering digital outputs. After more than two years of studies and intensive researches, the first SONOSAX SX-ST mixing console is delivered in late 2004. 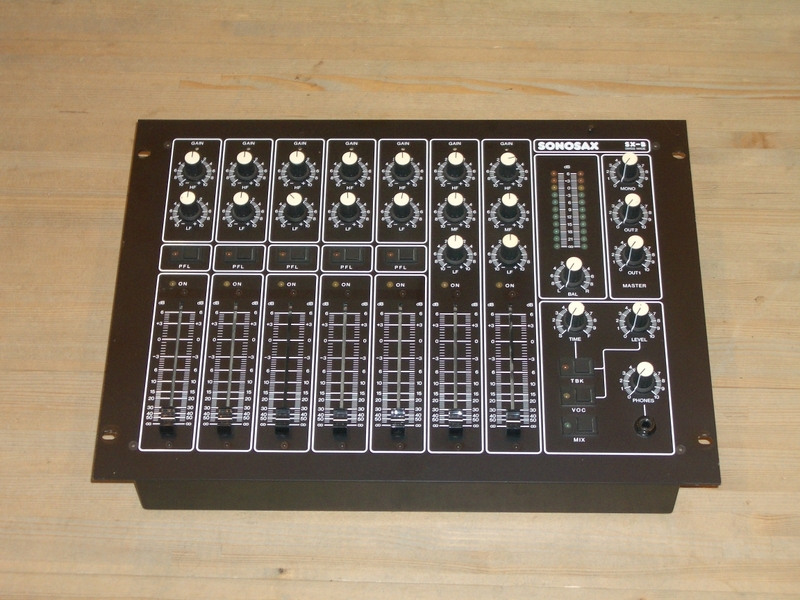 This new mixer reaches the perfection seeked by Jacques Sax. The development of new microphones preamps based on the latest technology gives it an exceptional sound quality that remains unmatched to this day. This sound quality corresponds to the SONOSAX policy which tends to do better than perfect. Based again on a modular concept, offering numbers of unique features and multiple possibilities of customization, the SONOSAX SX-ST is very versatile and can be universally used in many different applications. Thanks to its superb audio performances, the SX-ST was chosen by numbers of sound engineers for high quality recordings of classical music, however at its launching, the SX-ST has imposed itself almost naturally in the movie industry where it quickly acquires its credentials. To its credit one can notices famous feature films such as James Bond, Déjà Vu, Harry Potter, Pirates of the Caribbean among others. 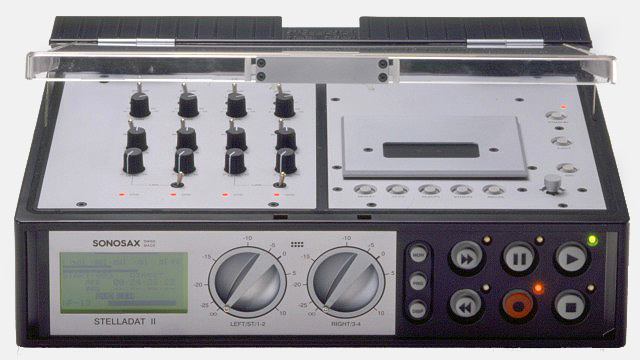 In the course of 2006, SONOSAX, always at the cutting edge of the technology, develops a height tracks recorder to be directly implemented into the SX-ST mixer, which is a world first. At these days, more than 150 units have been delivered and the demand for this exceptional mixing console keeps on growing. In its taller version, we will find the SONOSAX SX-VT. On the same quality and structured on the same model as the SX-ST, this console is available up to 48 channels or more. Several large mixers have been delivered to Korean Radio Stations, to the National Grand Theatre of Beijing and to the INA in France. SONOSAX has always been at the forefront of technology and innovation. In constant search for performance and ergonomic, Jacques Sax and his team embark on what appears to be a real technological challenge and by the end of 2006 SONOSAX is proud to announce the release of the MINIR82, the smallest professional multi-track recorder in the world. Recording up to eight tracks with a sound quality that corresponds to the reputation of SONOSAX, its small size and its ease of use ensure all users a complete satisfaction. Responding to a growing demand for portable, lightweight and small sized yet well performing devices, SONOSAX embarks on the development of two new products that will emerge respectively in fall 2007 and spring 2008. The first to come, it is the eagerly awaited SONOSAX SX-R4, a 8 tracks recorder on hard disk and Compact Flash card offering all the functionalities required for current methods of production such as time code, Metadatas etc.. As soon as launched it has met a great success and its sound quality, up to the reputation of the brand, is universally recognized. Based on technologies developed for the MINIR82, the SX-R4 has been created to provide a simple user interface, intuitive and effective. 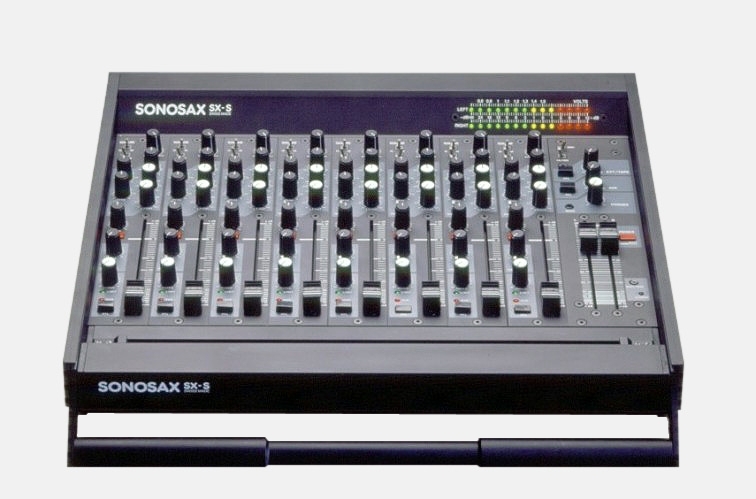 The second, the small SONOSAX SX-M32 mixer, was designed to be adaptable to the different specific needs of each user and thus it offers many possibilities of configuration and connectivity. It also provides with direct channels output and digital main outputs to feed digital recorder or digital cameras. The development of the mixer SX-M32 represented a new challenge for SONOSAX whose goal was to build a machine of highest quality but at a very affordable price. A successful bet, judging by the number of mixers delivered in a very short period of time. Armed with its recent developments, SONOSAX introduces in 2009 a new mixer to fill the gap between the small SX-M32 and the renowned SX-ST, too consistent for many applications. Thus the new SONOSAX SX-ES64 and designed, manufactured and put on the market in less than 18 months. Based on the model of the SX-ST but smaller in size, it is intended for outdoor production in the fields of film, television, sports events etc. As with all other SONOSAX mixers, the new SX-ES64 is configurable on demand to accommodate specific needs of each application. In a changing marketplace, SONOSAX still listening to users and strives to find innovative solutions, while helping to maintain a high level of performance, quality and reliability. There is no doubt that Jacques Sax and his team will continue to amaze with new products in the near future.